Good head - the kind embodied by that fluffy layer of bubbles that rests on top of your beer, the kind that lasts as long as you still have beer in the glass, the kind that leaves sticky lacing (aka the residual bubbles that cling to the sides of your glass) behind - is a topic that you'll see brought up over and over again on any homebrewing forum. A good head on a beer is not only attractive, but functional, as the bubbles in the foam tend to trap the aromas of the beer, which can lead to increased perception of this aspect (which is a huge deal for hoppier beers). With all else being equal, most homebrewers would prefer a beer with a great head to one without. However, good head retention in particular can be elusive. After all, one can usually get at least a decent head to form with an aggressive pour, but all too often - judging by the aforementioned popularity of this topic - getting that head to stick around is another matter altogether. 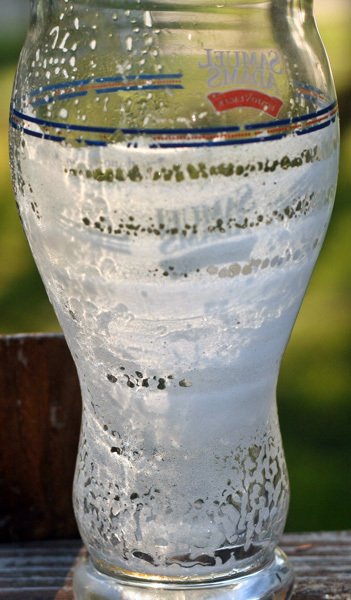 Beer foam is comprised of the bubbles that are formed as CO2 leaves solution. These bubbles attach themselves to certain compounds on the beer, which form a skin around the bubble. Obviously, lower carbonation levels lead to fewer overall bubbles, which can clearly impact formation of foam in the first place. However, the answer isn't simply to dial up carbonation levels to eleven, as good head formation and retention should be achievable in most typical carbonation profiles. Before we dive deeper into this topic, you should know that I am a troubleshooter by nature. In my professional life, I'm an IT manager; at home, I'm a DIY guy. I literally solve problems for a living; if you start talking about a problem to me, I'm already weighing possible solutions in my head before you've finsihed your explanation. It's just the way that I tick. When troubleshooting, I long ago learned that you always start off with your most common, simple causes behind a given issue (or, as a doctor might tell you, when you hear hoof beats, you think of horses, not zebras). So, let's look at one of the absolute most common issues with head retention problems - soap. Common dish soap, by it's very nature, is designed to break apart the very sorts of compounds that we need for head retention. Many dish soaps will leave behind traces of themselves in the form of a film (surely you have seen commercials for different brands of soaps that claim they don't do this, unlike the competition) - those traces can be devastating to beer foam. Likewise, the use of a rinse agent in the dishwasher (think Jet Dry) can be an insta-kill for our foam. As a result, my beer glasses never go through the dishwasher. Instead, use one of the various beer-friendly cleaning products (PBW, Oxiclean Free, etc). Most of the time, my beer glasses just get thoroughly rinsed immediately after use, with a good salt scrub after every few uses. Interestingly, there is evidence that a Star San soak (used in conjunction with proper cleaning) can do wonders for potential head retention. As another horse in the herd, do note that narrower glasses - with their lower exposed surface area of the beer - tend to do better in terms of head formation and retention as compared to wide mouthed glasses. Now, if you are certain that your glassware is not the issue, let's delve into the beer itself. Good head retention relies on stable bubbles. The two biggest contributors to stable bubbles are certain high molecular weight proteins and isohumulones (alpha acids from hops). The biggest detractors are fats and detergents - the latter we have hopefully ruled out at this point. There are certain products available to increase head in your beer, as some commercial brewers - particularly those who use large percentages of protein poor adjuncts such as corn and rice - rely on these. While that option is available to homebrewers (your LHBS likely sells one or more such products), I personally feel like you can probably address your root causes and avoid this solution. One of the simplest ways to increase head retention is to up the amount of dextrines and proteins in your beer by adding certain body-boosting malts to your grist. Crystal malts (though there is some debate over this one), carapils, carafoam, wheat malt, and flaked wheat/barley can all increase head in your beer. I am a huge believer that flaked barley can be absolute magic - four ounces of it in a typical five gallon batch of beer can do wonderful things while adding no perceptible flavor differences. However, all of these ingredients should be used sparingly, as they can impact the flavor of the finished product, and wheat and flaked malts can also cause cloudy/hazy beer. Consider your mash schedule. If you are performing a protein rest - which is often considered to be unnecessary with today's well-modified malts - you may well be destroying a lot of the higher molecular weight proteins, and thus killing your chance at a good head. You may also want to look at mashing at the warmer end of the range (say, around 158 degrees F) to encourage more body, and as a function of thus, better head retention. As mentioned above, isohumulones contribute to head retention, so highly hopped beers tend to have better head than those that are lower hopped. This mention is likely purely academic, as your beer style is going to be the biggest determining factor of your hopping rate. However, if you're all in for enamel-melting bitterness, don't be shy with those bittering hops - better head retention should be a happy byproduct of that. If you are using certain adjuncts, such as coffee, chocolate, spices, or oats, be aware that the fat content in these can have a negative effect on foam - or even make head retention essentially impossible. Allow your trub to thoroughly settle out prior to packaging, and be careful to leave as much as possible behind when racking. Trub contains certain fatty acids; reducing these can improve head retention. I have often noticed that beer that seems to be well carbonated will display better head retention after a little additional time in the bottle - I wonder if this settling is the cause of that? Also, don't overlook how you clean your brewing gear. Sure, you may be skipping soap on your glasses, but if you are using it on your carboys, buckets, kettles, etc - you may still be dealing with foam-killing residue. So, let's say that you have a reasonably hopped beer with plenty of body, you're using wheat (or some other foam-positive ingredient), you're avoiding foam-negative adjuncts, your glassware is impeccable... and you still get poor head retention. What gives? Consider Belgian and German beers that traditionally have very simple grists (often little more than pilsner malt, perhaps some sugar), fairly low hopping rates, and are often mashed at the low end of the range. Yet Duvel is famous for a rocky head that persists seemingly forever, and most Belgian and German beers are known for good to great head. Doesn't this fly in the face of everything we've talked about above? The difference, it seems, is the yeast. Certain yeasts produce more fusel alcohols and other foam-negative byproducts than do others. The traditional yeast strains used in Belgian and German beers produce lower levels of these compounds, which in turn can lead to great head retention even without worrying about specifically loading the beer with foam-positive elements. So, in the case of your awesome glassware and amazing foam-positive recipe design, don't neglect treating your yeast well. Make sure that you pitch enough healthy yeast, and keep your fermentation temperatures under control. Doing so will limit the stress on the yeast, and thus, limit the negative byproducts that can not only create off flavors - but also damage head production and retention. So, there you have it. While it's not exactly a simple, "one size fits all" topic, good head production and retention is within the reach of every homebrewer. Go make some suds, already.